I struggle with the following reality: I seek to think and write seriously about visual culture, including ethnic representation, and I am a lifelong Cleveland Indians fan. On the positive side of things am pleased to report to those indifferent to playoff baseball that yesterday said Indians defeated the New York Yankees in the American League Division Series, in a reversal of historical realities. (As a matter of fact, long ago the Yankees swept the Indians, with a combination of deadly microbes, superior numbers, colonial imperatives, and dominant duplicitous bullpen.) In celebration of the anti-historical events of the evening just past, I post above an image of the great Bob Feller, who lead the Indians to their last World Series Title in 1948, a dozen years before my birth. But there are Indians, and there are Indians. Given the degree to which American Indians have been reduced in number and marginalized in the era following their near extermination, it’s hardly a surprise that majoritarian impulses, even when astonishingly crude, go largely unchallenged except in the rarefied precincts of universities. (See Dartmouth College and more recently the University of Illinois.) Hence, the mortifying figure of Chief Wahoo remains in use on the shores of Lake Erie, which nowadays is not exactly Gitche Gumee. A good question indeed. If Chief Wahoo is not a Jim Crowization of a nearly vanished population, I don’t know what is. In truth, Wahoo got his start in comics. A man of few syllables, poor noun-verb agreements, and an eschewer of indefinite articles, the Chief appeared as a sidekick in The Great Gusto, drawn by Elmer Woggon and written by Allen Saunders. The strip first appeared in 1936. Chief Wahoo gave his name to the strip for awhile, then played second fiddle to Steve Roper, an adventure hero. Wahoo dropped out of the strip in 1947, but caught on in ’46 as the Cleveland Indians’ mascot. The baseball team had been founded as a charter member of the American League in 1901, but did not assume the nickname Indians until 1915. The first logos were not especially well-rendered, but they did emphasize an illustrative approach, as opposed to a cartoon-like one. Mad Anthony Wayne has got his sword out. He’s listening closely from an awkward crouch. Wayne half expects somebody’s dog to come tearing around the recycled plastic outdoor play set and crash into the dogwoods, among which he’s stopped to get his bearings. But the beast never comes. After a minute he steps out of the trees and slips around an air conditioning unit into a sideyard. The turf slopes down to the street, giving a view of Heathermoss Glen Trail on its looping route through the new Mansard Woods subdivision. Wayne adjusts his hat, then drinks in the view of the street spread out before him. The quickest glance tells him: bad period for domestic architecture. Fortresses costumed like cottages line the street. Ponderous loads of brick bear down on cheap squat entryways with fake multi-pane windows. The proportions have been worked out by a badger. Wayne looks beyond the allotment to the commercial strip on Muskingum Avenue, and on to the purple curtain of leafless trees arrayed as a backdrop half a mile off. In 1793 Wayne leads a contingent of troops through these very hills, toward Fort Recovery further west. The Shawnee chief Blue Jacket knows he’s coming. By this time, Little Turtle has seen the writing on the wall, and forecast the end of the Confederacy. But Blue Jacket disagrees. He figures that killing off Wayne will put the scare back in the United States, and buy the Indians more time. So Blue Jacket and his warriors are hiding in among the folds of present-day Muskingum Plaza and Mansard Woods. They trick the scouts that Wayne sends on ahead, and are there waiting when the first detachments come through. Wayne looks across at the minivans and the car wash place and the Higgins Family Restaurant, squinting at the invisible gravesite. Underneath all that concrete and asphalt the ground remembers the blood that dampened it. But the people here are oblivious. Because a veneer of settlement has been troweled over what Wayne knows to be there—corpses, both Yankee and Indian. Under the salad bar, over by the tow truck, along the fronts of these massive, ugly houses, you can find the dessicated fruit of Blue Jacket’s ambush and Mad Anthony’s counter-assault. Wayne knows their names—at least the American ones—but the people in the happy sedans with stickers about honor students do not. They are clueless to the war. But they stay busy anyway. They’re improving their positions. Managing contacts. Transferring funds. That sort of thing. They navigate their various hollows, heathers, dales and glens, where the Sucke Brothers—so far, yet a rumor here—are coiled like snakes. (copyright 2007 D.B. Dowd). The hook-nosed brown skinned Chief Wahoo appeared on the Indians’ uniform from 1946 to 1950. The even more egregious fire-engine red image, worthy of the worst of Sambo, appeared in 1951 and remained in use until 1972, then returned in 1980 and remains a fixture on Cleveland uniforms. Meanwhile, I am left with the spiritual and material facts of my fandom. I began cheering for the Indians as a small child, when they invariably stunk. I recall Max Alvis, the chew-chomping third baseman through the mid 60s, and Sudden Sam McDowell, the hard-drinking lefthander who squandered much of his talent. We used to drive the 55 miles to Cleveland to watch doubleheaders (the best value, now extinct in MLB). 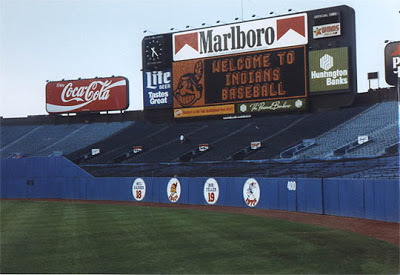 I remember brutal days against the Yankees and also especially a doubleheader against the A’s of the mid-70s, in which the Indians got swept something like 13-1 and 7-0. Plainly, the figure of Chief Wahoo ought to go the way of Amos and Andy. Not because he is an image of an American Indian per se, but specifically because he is a grotesque figure More on this presently, when I am fresher and better able to reflect in prose on the issues involved. Anyway, I will return to Indians and baseball, separately and together. When the League Championship Series are underway, look for an outstanding art and sport combo contest for the discriminating fan and graphic connoisseur.